I’m a freelance commercial field archaeologist, prehistoric stone tool specialist, Honorary Research Fellow in the Department of Archaeology at Durham University, and a Fellow of the Society of Antiquaries of Scotland (FSA Scot). I was recently Archaeological Project Officer for Breedon Group’s Black Cat North aggregates quarry, Bedfordshire, as well as being involved in other community and commercial projects. I studied archaeology at Durham in the 1980s and, after an extensive business career, currently research the early prehistory of north-east Yorkshire and Teesside. I was recently chair of the Teesside Archaeological Society, sit on the committee of Council for British Archaeology Yorkshire and the council of RESCUE: The British Archaeological Trust, as an advocate for our archaeology, heritage-at-risk and the profession. I am an affiliate member of the Chartered Institute for Archaeologists (CIfA). 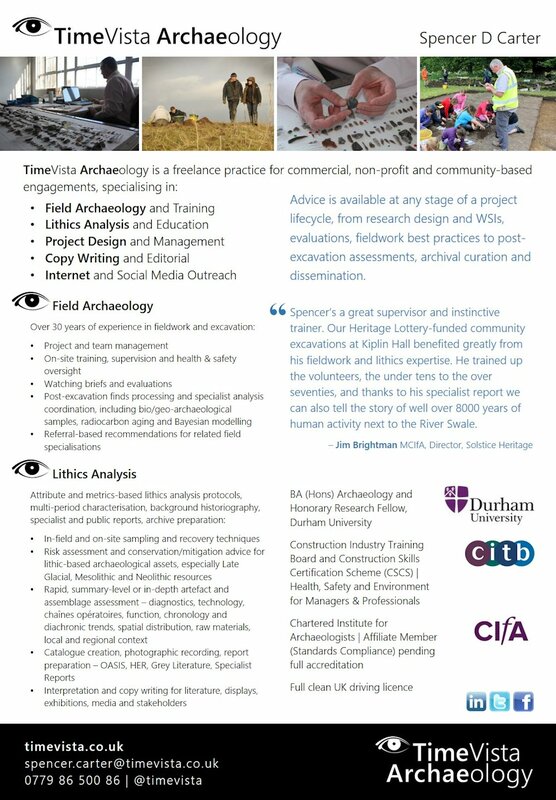 I am available for field engagements and consultancy about field archaeology projects, lithics analysis and training delivery. Since graduating, I have worked in a variety of international roles for hi-tech global corporations. These include senior management positions in business and sales operations, with substantial business and customer-focused experience in project and change management, budget control, organisational leadership, team building and customer service—a unique suite of skills that complement my archaeological and heritage portfolio. Black Cat North, Bedfordshire | Project Officer for multi-year strip-map-sample at 30ha aggregates quarry (Breedon Group) through to final publlication (2016-17) | In association with Archaeological Research Services Ltd.